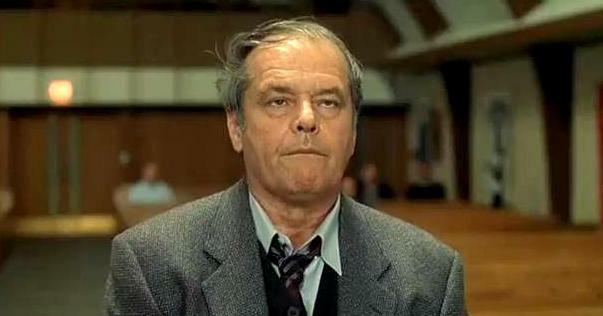 Jack Nicholson stars as Warren Schmidt, a sad-sack senior citizen who’s just learning to cope with life after retirement when his wife (June Squibb) dies unexpectedly. With nothing to do but write weepy letters to Ndugu, the unseen African boy he recently sponsored through a children’s charity, Schmidt hops into his Winnebago and embarks on a soul-searching road trip. After depressing visits to his childhood home and his alma mater, which he details in protracted letters to Ndugu, he visits his only daughter (Hope Davis), hoping to prevent her impending marriage to Randall (Dermot Mulroney), a trashy waterbed salesman. The film’s maudlin tone is briefly suppressed by the strained quirkiness of Randall’s mother (Kathy Bates), only to return full force for a conclusion so treacly it defies comprehension. Tags: Criticism, Film Reviews, Q Syndicate. Bookmark the permalink.